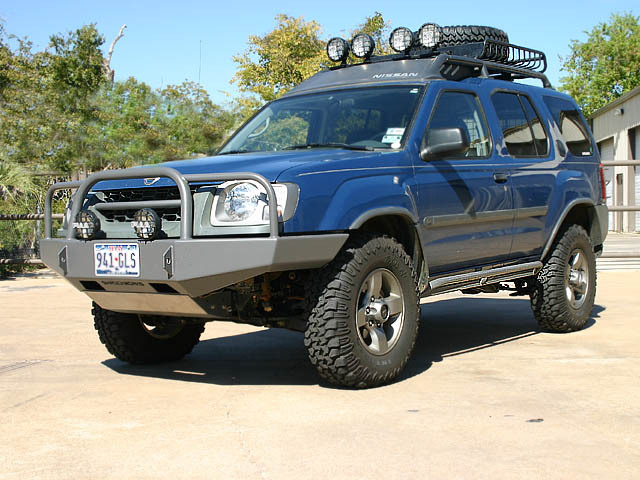 If you like to play hard in your Nissan Xterra, it's time for some serious protection. 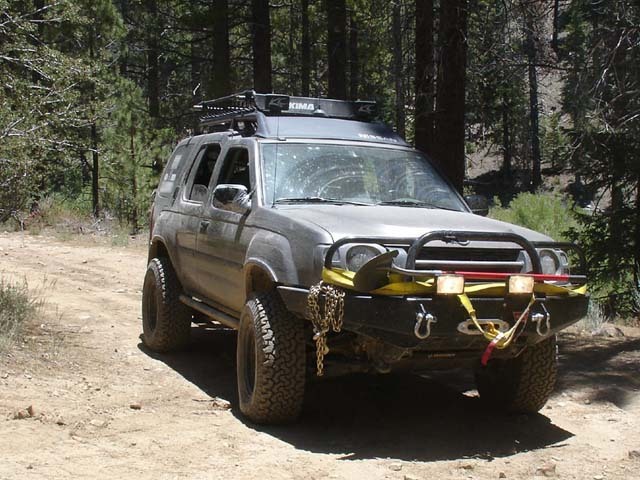 The low hanging plastic factory bumper is easy prey for the rocks and ruts offroad. 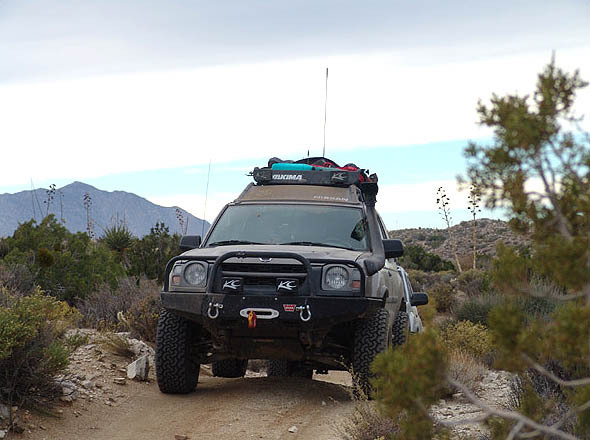 The ShrockWorks winch bumper is just the ticket to even the odds and allow you to charge ahead with confidence. 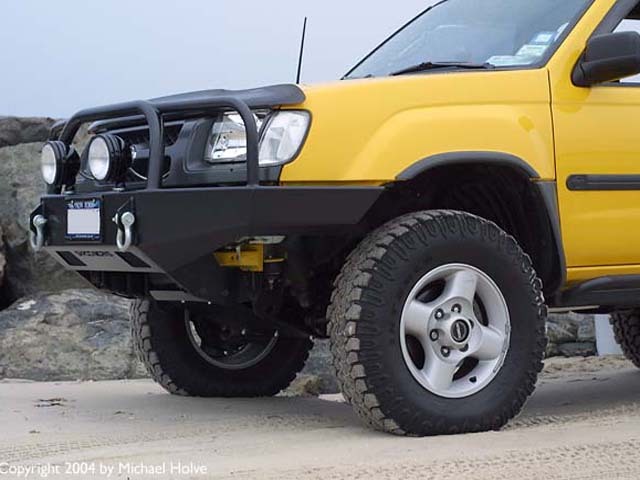 Don't waste time with a wimpy brush guard or grill guard for your Xterra or Frontier. They often cause more damage than they prevent after a hard knock. 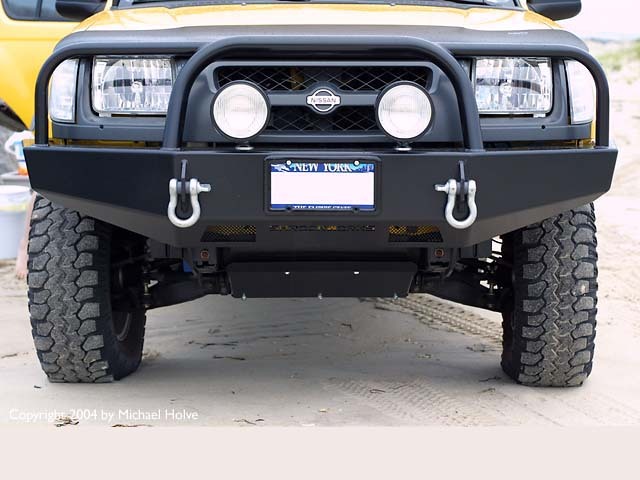 You can have a great looking bumper that offers real protection and a winch mounting location too. You are looking at the best bumper on the market for your Xterra or Frontier. Like all ShrockWorks products, it is computer designed in 3D CAD, CNC cut and formed. It's also designed to be very strong. 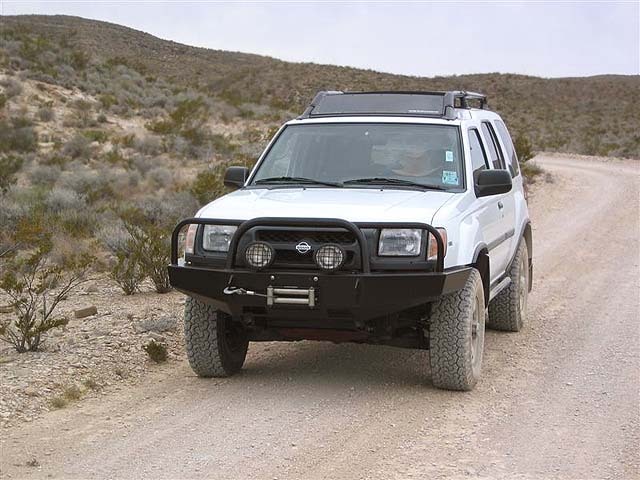 Unlike some other bumpers on the market using thin gauge sheet metal less than 1/8" thick, this bumper is made from 3/16" and 3/8" thick plate steel. Despite the beef, painstaking design work on this bumper has kept the weight down to a very reasonable 105lbs. 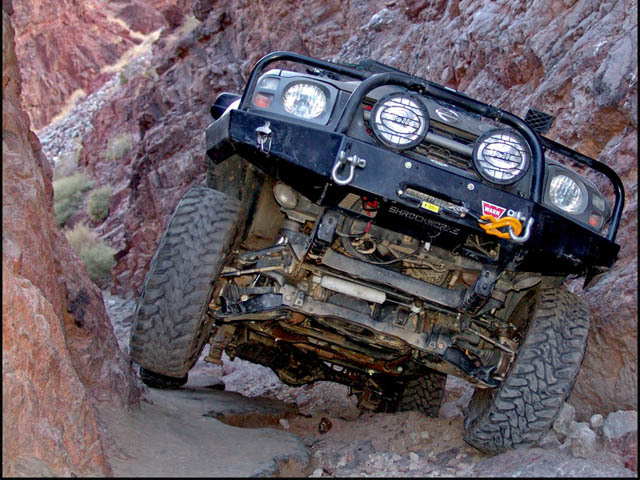 - Optimized for off road performance with greatly improved approach angles. 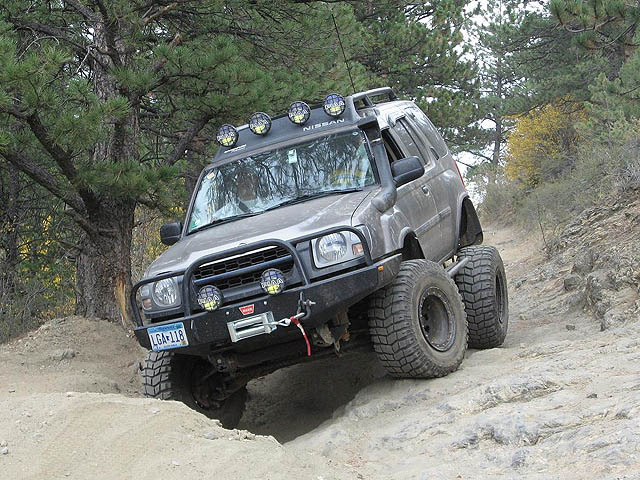 It actually hangs down 3 inches less than the ARB bumper. 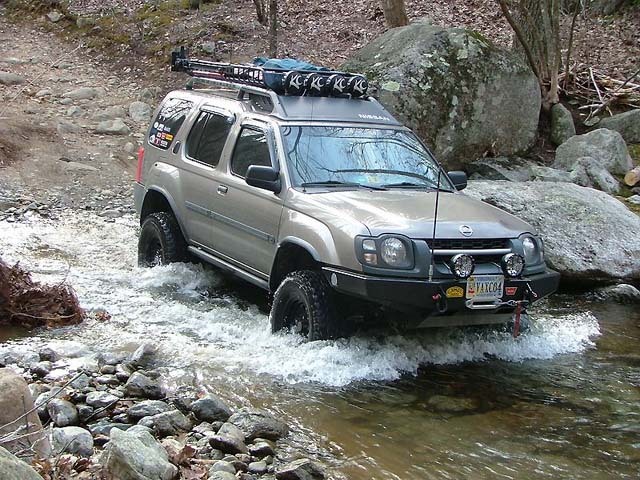 - Hidden winch mount accommodates most integrated and non-integrated solenoid winches up to 9500lbs. 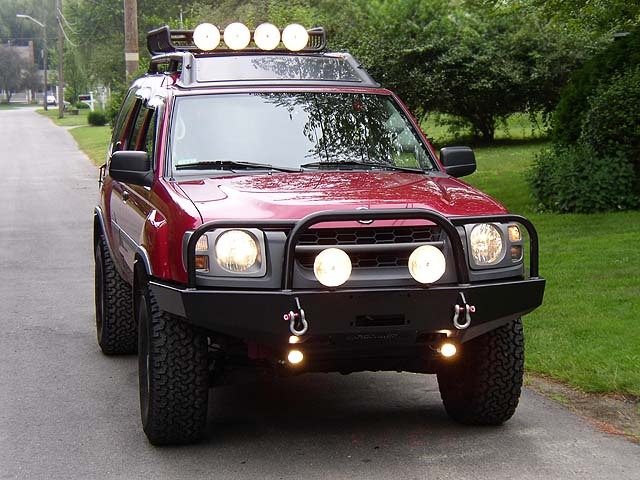 - Looks great with or without a winch installed. No gaping empty hole where the winch would be. - Designed with clearance in mind for larger tire upgrades. - Installation is a simple bolt on with six mounting points. 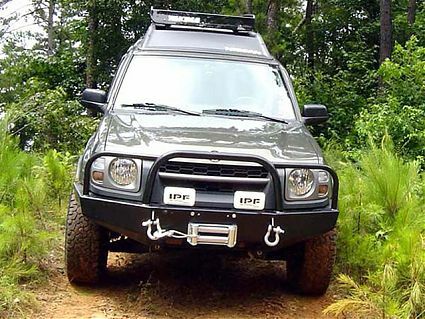 Newer Frontier requires some minor cutting on the factory plastic bumper/grill. - Optional skid plate shown in image #10/13 on this page, made from the same material as the bumper. The skid plate will come finished the same as the bumper. - 3/8" plate steel mounting brackets and integrated recovery points. - Finished in optional, show quality powder coat. Bumper is amazing, such an easy install too! WOW. This bumper is awesome! It looks great and is very well-built. You can't get a better or stronger bumper than a Shrock. Awesome bumper! I've had mine for over 2 years and it works great! Even after good beating the powdercoat finish is still there, and the bumper is top notch in performance, functionality and quality. The bumper is the best. 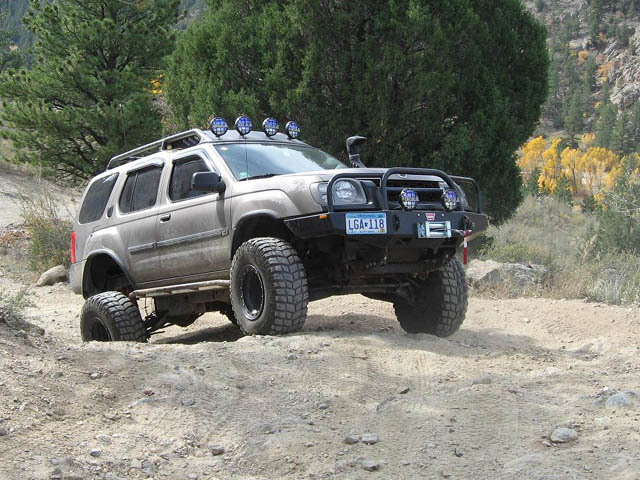 It's a very sturdy addition to your Xterra. Mine's been beat, yanked on, and just plain abused and it still looks great and protects the front. This bumper is amazing, pictures do not do it justice! 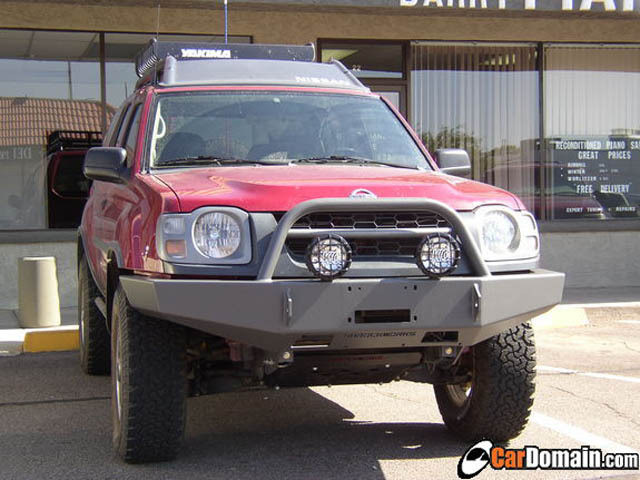 Amazing workmanship and powdercoat, your xterra will break before the bumper! Jim, you and your staff do AMAZING work. After several months waiting for the bumper (after years of dreaming about ordering it), I finally installed it, and I am completely impressed. First day I had the new bumper on, I got backed into at work. By a full-size, lifted truck. Not a SCRATCH on the bumper, and some pretty hefty damage to the Ford's rear bumper. I can't praise your work enough, this bumper is military-grade. I'd feel better every time I'm in Iraq if every HMMWV had one of these things on the front! Cheers! The bumper is awesome! It is extremely tough and looks great. Anyone can install it. easy to line up and looks perfect! 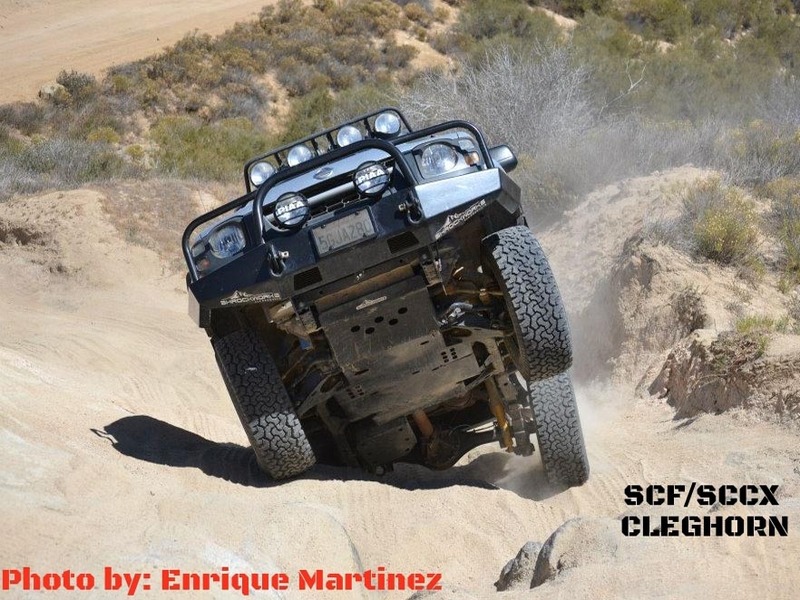 This is a must have for anyone who offroads or anyone who even has an x! High Quality, Easy Install. Worth every penny. This bumper cured my AIDS.. It is THAT awesome.